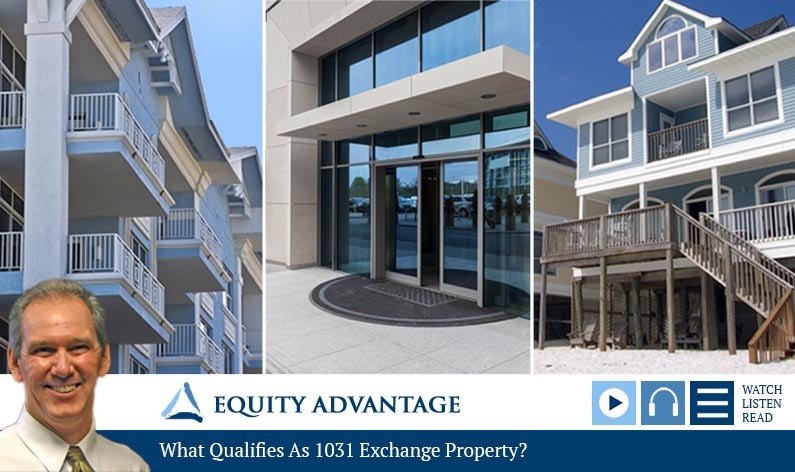 What Qualifies As A 1031 Exchange Property? Tax overhaul legislation passed in January has made quite a few changes to what qualifies as 1031 exchange property. Lamenting the loss of some of his ‘favorite’ investment types, David Moore offers a complete update in this episode of his popular blogcast series. Today we’re talking with David Moore, co-founder of Equity Advantage, a firm that specializes in tax-deferred investments, in particular IRs section 1031 exchanges. David, What Qualifies as a 1031 Exchange Property? David: Well, any real property to be held for productive use, trade business, or for investment will qualify. Something that comes up more often today in recent times, is properties that are flipped. We need to be careful that it’s something to be held for investment instead of resale, and people are always wanting a minimum required hold period for a property that would qualify for 1031, and we really don’t have one. If it’s a related party transaction, then there’s a two year minimum hold for those transactions, but if it’s an arm’s length transaction non-related party, there’s no required stated minimum hold in the code. David: Well, as of January 1, 2018, we used to be able to do transactions for the fun stuff. Cars, boats, planes, businesses, artwork, other things, and we lost the ability to handle transactions of those assets as of January 1 with tax reform. When we’re looking at what qualifies for real property, when I started this business with my brother in 1991, and in those days people would say, well, I remember when like-kind on real property would be a direct application, true like-kind, house for house, land for land, and it’s really never been the case. David: Contrary to popular belief, there really haven’t been any changes if we look at what is like-kind, what qualifies for 1031 treatment on real property. Thank you, David. Listeners may call 503-635-1031, or you can visit 1031exchange.com for more information. Rules on 1031 exchanges are changing and this is a good example. Too much is at stake not to get expert advice: call David and the Equity Advantage Team today!